Fundraiser by Phil Demers : Defend animal abuse whistleblower. In 2012, the Toronto Star investigated Marineland Canada , speaking with many former employees who revealed a wide array of animal neglect, abuse and cruelty at North America's now infamous zoo. Most spoke on the condition of anonimity for fear of legal reprisal, however some bravely elected to reveal their identities. Shortly thereafter, Marineland launched a series of legal assaults and intimidation tactics - threatening and suing media and whistleblowers alike in an attempt to silence the truth. Philip Demers, former head trainer of Marineland's stadium show revealed details of water quality issues, short staffing and several incidents of animal neglect/cruelty. 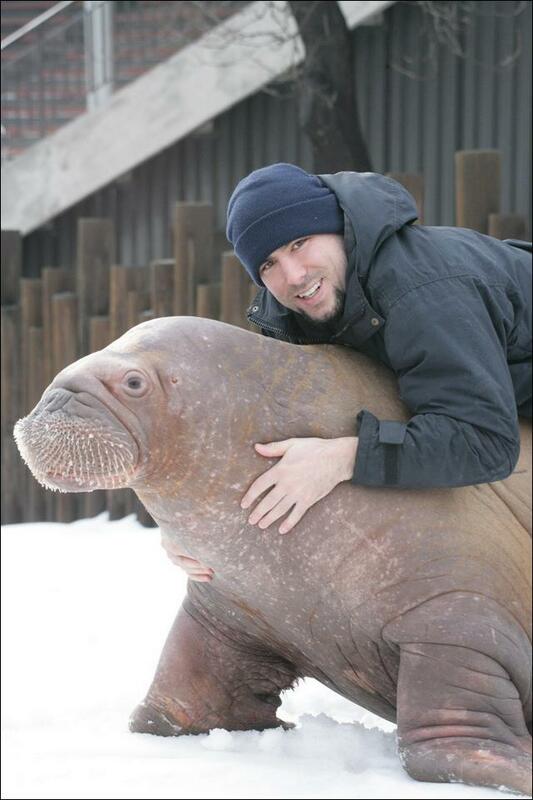 The deteriorating health of Smooshi the walrus inspired his decision to speak. He is being sued for "plotting to steal a walrus ", a spurious claim to say the least. The lawsuits are known as SLAPP suits - Strategic Lawsuits Against Public Participation - and serve only to silence critics and stifle debate around public interest issues. They aren't designed to see a courtroom, as few defendants can afford the lengthy and costly process. Despite Marineland's abusive assaults, Phil continues his advocacy for Marineland's animals. Orca captivity has been banned in Ontario , new standards of care and animal protection regulations take effect in May of 2018 and Canada is moving to ban dolphin, whale and porpoise captivity nationally. Whether you're an animal lover, truth advocate or simply believe in freedom of speech - your support in this campaign is integral for the justice of Marineland's animals, and those who continue to sacrifice and fight to be their voice. We cannot let Marineland get away with this! Please support the good fight today! Thank you as always for your continued support. Sadly, since the passing of Marineland's founder John Holer (an event we believed would likely end Marineland's legal pursuit), lawyer's have informed us that they intent to continue with their SLAPP lawsuit. Accordingly, I've increased the goal of this fundraising campaign to reflect the assumed additional costs. Remember: Justice delayed is justice denied. UPDATE: Please watch this mini-documentary about Smooshi the walrus and former trainer Phil Demers before Marineland sues to have it removed! Can't thank supporters enough for keeping us in this fight. We've surpassed $20k, which is over 50% of our stated goal. As our most recent motion dates have been adjourned, new dates are being rescheduled. We will keep you all notified on our progress, as we hope to put an end to these lawsuits. Thank you! Amazing! We've reached 33% of our campaign's goal. We've instructed our lawyers that money is on the way, and we will be moving forward shortly. Thank you all, and especially to Joe Rogan for his support of our cause. Much love! This past November I had the rare opportunity to swim with wild Orcas in Norway. It was a pleasure to see free Orcas in the water. There were hundreds of them because it is herring season. Looking at them swimming, catching herrings and swimming long distances, made it even more clear to all of us, that Orcas, dolfins and all marine mammals, are not suited to be forced to live in such little enclosures. The way Orcas and dolfins are forced to do tricks, and the way they have to live in little tanks and eat dead fish, is the worst kind of animal abuse that I know. These "abusement parks" must be closed. All proceeds go directly to lawyer and court costs, the sum of which is already over $100k. I have refused to go to Marineland for a long time. Can't stand the thought of these wonderful creatures in captivity. Hi, You all amaze me. I can't express how much your group impresses me. Unfortunatly I can not donate no matter how much I want to. I'm disabled and live on a strict budget so I honestly can't help financially but you'll be in my heart. Keep up the good fight. Be proud. Be confident. Be strong. Best of luck & God Bless. Is there a petition to sign to get this stopped? What a better day than Valentine's Day to share the love of all of God's creatures. This is a sad but unfortunate truth today about one man against big corporation but speaking out when cruility is afflicted upon the innocence of God's precious animals. Thank you, Phil for the bravery to stand up against the evilness of the times in which we live. Hey are you selling those tee shirts that you showed on jre? Seems like an opportunity gain some extra support. plus I would love to rep my support on the daily. Why would Marineland try so hard to defend themselves against mistreatment of these beautiful creatures. Why would they NOT want the best for the animals in their care. Personally, I would like to see this "amusement" park and others like it shut down for good. I have absolutely NO interest in paying to see creatures that SHOULD only be seen in their natural habitat do tricks for my (so called) entertainment. When I see the ads come on TV, I turn the channel as I find them disturbing. Do these trainers and the owner of this facility not have a conscience!!! Really sad. All marineland's should be closed. Disgusting and sad what they are doing there. And they should be animal lovers? They just look for profit. i really need some help with my mission trip fund, if anyone could donate anything that would help a lot. thank you. HSI Canada is being notified via the US office. Chances are you have already contacted them but, couldn't hurt coming from US office too! Just curious, the funds collected here are going toward paying the lawsuits you (Christine Santos, Jim Hammond, and Philip Demers) have received, correct? This is important and I want to say that I was on the right side of history in a small way. I am so thankful for all that is being done to support these amazing animals! Thank you, thank you so much!